Lots of random blossoms and flowers keep appearing. Camera is kept busy! I heard a dreadful noise outside last night around midnight. I guessed it was the local possums – although they do sound like a pack of angry zombies rather than these cute furry things! They were charging up and down the side veranda squabbling! I got a couple of dodgy shots and are they ever FAT! I wonder what they have been feasting on, since there is nothing on the fruit trees yet. I also made a nice big batch of lemon cordial (concentrated fruit drink? lemonade?). 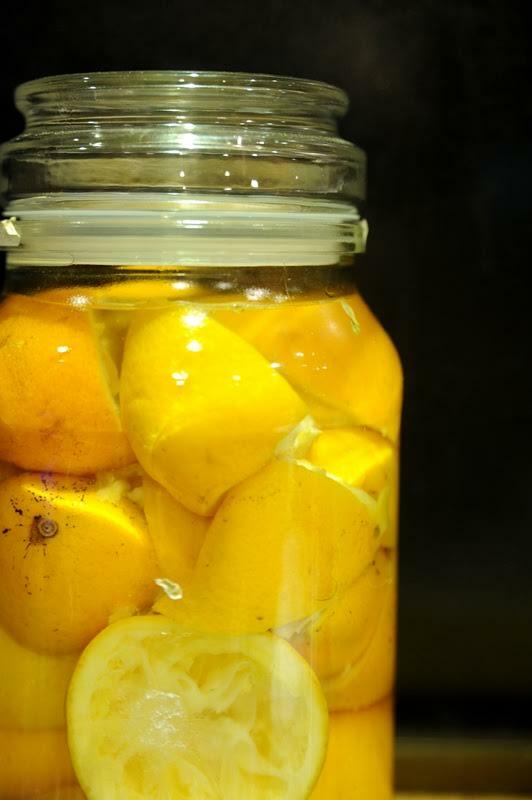 Instead of throwing away the lemon peels or composting them straight away, I put the lemon peels in a jar and poured white vinegar over the top to make a citrus cleaner and sealed the lid on and left it for a couple of weeks. Then I strained the liquid into a spray bottle and voila! A lovely non-chemical all purpose spray cleaner that smells great. I really enjoy using it. You can use any citrus peel for the cleaner or the cordial, but Great Aunt Ruby’s lemon tree is laden right now, so lemon it is! Wow! Aunt Ruby looks amazing!! I really like how you use your lemon peels to make a cleaning solution! Always hearing from you Lisa…thanks for the great pictures..especially Aunt Ruby. I want to be like her!!! I am collecting photos of Ruby and her garden so I can send Mavis another post sometime! I am working in her garden but she doesn’t leave me a lot to do at times!! She’s amazing! Thanks for the tip on making citrus cleaner! Next time I make lemon cordial that’s what I’ll be doing with the rinds. Hobnails! You got that right! I love the ringtails! We have had them here in the past and they are adorable! I only just started making that citrus cleaner (last month) so its new to me, but I really like using it. I want to make an orange one next – got to mix things up a little! Ummmmmmm, that’s a possum!?!? I’m in Oregon and I’ve never seen a brown one, let alone one that fat!!! That made me laugh Mindy! This is an Australian Brush Tailed Possum. Its a marsupial – and yes – I think this one is fatter than normal. Clearly is living the good life on our property! Happy Birthday to Aunt Ruby from Idaho where we have lots of potatoes.